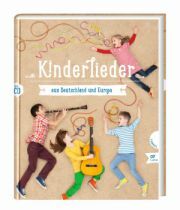 “With the Kinderlieder aus Deutschland und Europa [Children’s songs from Germany and Europe] we are sending songs out into the world. They are a small peephole to view other cultures and traditions, making it possible to achieve a playful musical contact with our neighbors.” (Peter Schindler) The “Vokalhelden” [vocal heroes] from the Education Program of the Berlin Philharmonic interpret 22 children’s songs from throughout all of Europe in arrangements by Peter Schindler. The songs are performed in their respective languages, often with a German transcription. 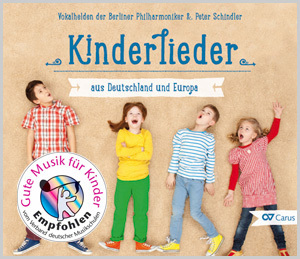 This CD is part of the “Lieder project” which promotes and benefits singing with children. This project presents texts, music and recordings of songs to sing. It emphasizes quality and is designed especially for children. The goal is to once again focus on singing together in families. To date, 100 solo singers, vocal ensemble, choirs, instrumentalists and over 300 children have offered their time and talents to the Carus Lieder project. Profits derived from the sale of books and CDs in the Lieder project have now reached 400,000 Euros – these proceeds are being donated to causes which further singing with children. Warnung an alle Eltern: Dauerbetrieb des heimischen CD-Spielers und Ohrwurmgefahr ist nicht auszuschließen. Die ausgewählten Titel dieser CD sind eine bunte Mischung unterhaltsamer und gelungener Interpretationen. Besonders Eltern, die die ewigen Wiederholungen der poplastigen, sich gleichenden Kindermusik leid sind, werden sich über die abwechslungsreichen Arrangements freuen. Mit dieser verspielten, tänzerischen und originellen Aufnahme gelingt es den Vokalhelden mit Sicherheit, ihre Hörer zum Mitmachen zu animieren.